Hope Studios: Paper Snowflake Tutorial and A Quick Tip to Get You Through the Holiday Party Season! Paper Snowflake Tutorial and A Quick Tip to Get You Through the Holiday Party Season! Paper Snowflakes, originally uploaded by hopestudios1. Begin with a square piece of paper. Save the strip of paper that is leftover to make paper chains! Notch the end of the triangle opposite the tip for a star-shaped snowflake. 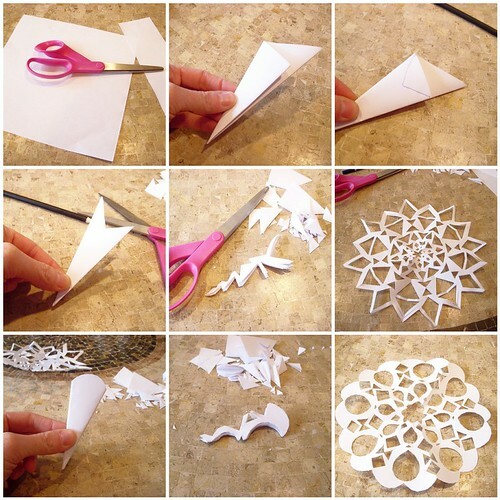 Cut away as much paper as you can while maintaining enough edges to keep snowflake intact. Round the end opposite the tip for a round snowflake. Cut out circles and triangles. Now you have something to bring your appetizer on without risk of losing your good platters. Line them with lettuce leaves or cute paper doilies and rest easy. You can tape a sweet note to the bottom and leave it as a hostess gift. She will love you for it, and maybe even pass it on to the next hostess! Cindylou has been busy making snowflakes like craaaazy over here!!!!! She made a "blizzard" in her room!!! And yes, I have used that tip of yours for years....it's terrific!!!! Mine always turn out looking less like snowflakes and more like geometry failures. What a delightful entertaining tip! I always forget about the Dollar Store & end up in Stop & Shop! I LOVE the hostess gift tip! I'll remember that next time! That was great Noah my six year old grandson is here and we're laughing our hearts out trying to make a snow flake..
You make it look so easy ...I may have to try it today! Ironing must be the key....Oh yeah, and the cutting part! Ironing the snowflake is BRILLIANT! Thanks so much. Oh I love the snowflakes ♥ ! 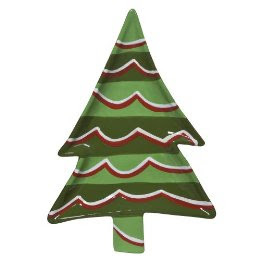 And that tree-shaped platter is so cute.